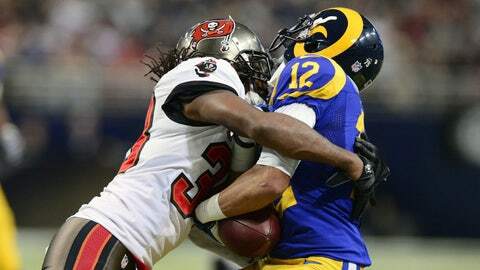 Bucs safety Dashon Goldson was fined for this helmet-to-helmet hit on Rams receiver Stedman Bailey in Sunday's game. Tampa Bay Buccaneers safety Dashon Goldson was fined $60,000 for a helmet-to-helmet hit against St. Louis Rams wide receiver Stedman Bailey last Sunday. However, he avoided a second suspension this season. The contact, which drew an unnecessary roughness penalty, occurred early in the fourth quarter of the Ramsâ 23-13 victory at the Edward Jones Dome. Bailey caught a pass from Kellen Clemens, and contact was made at Tampa Bayâs 12-yard line. Four plays later, St. Louis extended its lead to 20-13 on a 25-yard field goal by Greg Zuerlein. Goldson, 29, has found himself in trouble many times this season, his first with Tampa Bay. Before the latest incident, Goldson had been fined for hits in Week 1 against the New York Jets, Week 2 against the New Orleans Saints, and he was suspended one game for a hit against Atlanta Falcons wide receiver Roddy White in Week 11.